You will need documentation to verify military service. Discharge papers are usually the verification needed. If you have lost your copies, we can help you secure them. A flag must be requested. One flag per veteran must be requested on a form, U.S. Flag for Burial Purposes, from the V.A. Regional Office or from the U. S. Post Office. We will request your flag and have it ready for presentation. Military Funeral Honors must be requested in advance. We make the request for you from the appropriate military organization. We usually use VFW Gold Post 7023 or American Legion Post 752, both in Perryopolis. If you belong to a different one, we will contact them for you. The service usually includes the presentation of the flag and the playing of taps. 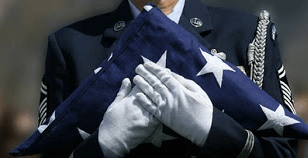 Caskets are not provided free, unless the veteran dies in active duty. Payment for the burial was made without any other government reimbursement. The veteran was disabled due to a service related injury. We will fill out the Application for Burial Benefits and send it in for you. Any member of the armed forces who dies in active duty. Any member who was discharged under conditions other than a dishonorable discharge. Cremated remains are buried or entombed with the same honors as casketed remains. A Flat Bronze Marker is provided by the V.A., but installation is the family’s responsibility. You honored your country by your service. Now let the Blair-Lowther Funeral Home, honor you by conducting a dignified service.